Evidence suggests that gender differences exist in the severity of many immunological diseases and their response to glucocorticosteroid treatment. In this report, we have used a murine model of ovalbumin-induced lung inflammation to address whether gender could affect the systemic response, airway inflammation and hyperreactivity and their responses to budesonide. Following an acute ovalbumin challenge, actively sensitised BALB/c mice developed a time-dependent increase in interleukin-4 and interleukin-5 production and inflammatory cell influx into bronchoalveolar lavage fluid. Apart from an increased number of lymphocytes in female mice at day 3 post-challenge, none of the above parameters were affected by gender. Blood leukocyte numbers were also unaffected, whereas a two-fold increase in total serum immunoglobulin E was observed in female mice. Budesonide, given intranasally, did not affect the blood parameters, but dose-dependently inhibited the pulmonary inflammation and airway hyperreactivity in both male and female mice. Female mice were slightly less sensitive to budesonide's inhibitory action on interleukin-5 production and the development of airway hyperreactivity. Our results suggest that, apart from a 2-fold increase in serum immunoglobulin E levels observed in female mice, gender is not a major factor in the present murine model of ovalbumin-induced lung inflammation. In contrast, gender might slightly influence the potency of test compounds such as steroids. The immune system shows a marked gender dimorphism, which is reflected by the different susceptibilities of men and women to specific immunological disorders. As such, men have a higher risk of bacterial and viral infections [1, 2], whereas women seem to be more susceptible to autoimmune or inflammatory diseases . Bronchial asthma is a chronic inflammatory disease of the airways, a prominent feature of which is an intense infiltration of inflammatory cells. Of these, T-cells of the T helper 2 subtype and eosinophils are believed to be the main protagonists inflicting injury to the bronchial mucosa. This damage contributes to bronchial obstruction and airway hyperreactivity observed in asthmatics. Inhaled corticosteroids remain the anti-inflammatory drugs of choice in the treatment of this disease . We and other laboratories have developed murine models of allergen-induced lung inflammation that demonstrate some of the characteristic features of human asthma [5–9]. However, female and male mice are used indifferently in these models and the possible influence of gender on the allergen-induced lung inflammation has never been studied in detail. One study addressing this question has shown that the systemic allergic response to ovalbumin (i.e. 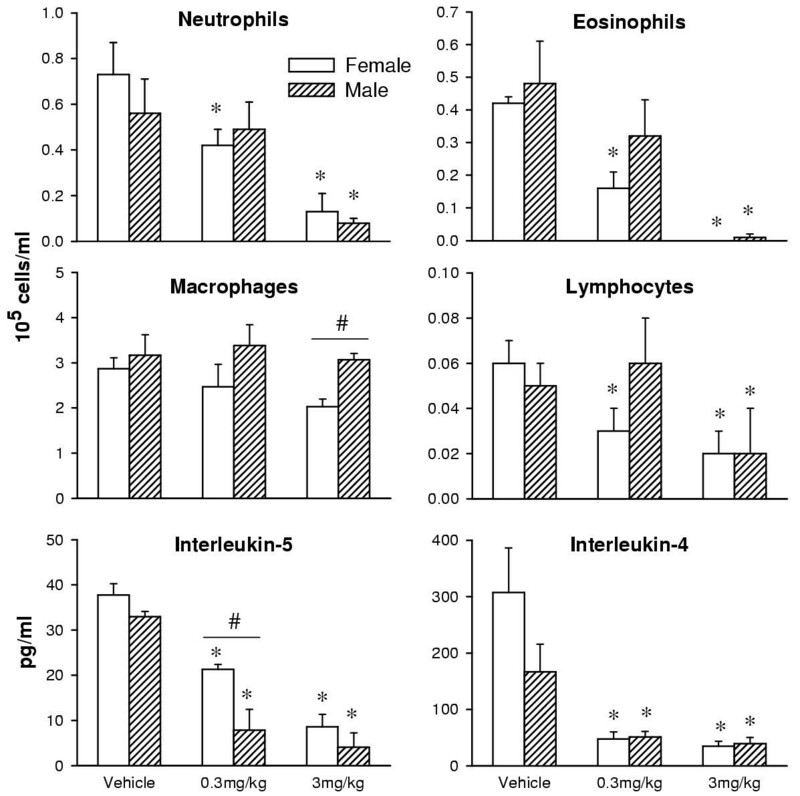 serum immunoglobulin E and blood eosinophil levels) was greater in female than male mice. However, a systematic study of the lung inflammation following local allergen challenge was not performed . In this report we have used a previously characterised model of ovalbumin-induced asthma in BALB/c mice  to investigate whether gender could influence development of the inflammatory response, monitored by bronchoalveolar lavage parameters of inflammation and airway hyperreactivity as well as total serum immunoglobulin E levels and blood inflammatory cells numbers. Since published work suggests that the action of glucocorticosteroids can also be gender dependent [3, 11], we have also studied the effect of budesonide, a glucocorticosteroid widely used to treat human asthma. In both female and male mice, ovalbumin-induced bronchoalveolar lavage inflammatory cell infiltration was followed up to 14 days after the challenge (Figure 1). An early neutrophil influx was observed, peaking at day 1 and going back to baseline at day 3. This early neutrophil influx was followed by an increase in eosinophil numbers, starting at day 1, peaking at day 3 and returning to baseline by day 14. Lymphocyte numbers increased by day 1, peaked at day 3 and came back to baseline by day 14. No significant variation in the macrophage numbers was observed. The time course of ovalbumin-induced production of the bronchoalveolar lavage T-helper 2 cytokines (interleukin-5 and interleukin-4) was also studied. Both cytokines showed the same kinetic pattern, appearing at 6 hours, peaking at day 1 and coming back to baseline by day 2 (Figure 1). However, approximately 10-fold more interleukin-4 was produced compared to interleukin-5. The overall kinetics for each of the parameters studied was similar for both genders, with the only difference being a significant increased number of lymphocytes in female mice at day 3. In sham sensitised mice (Alum only) challenged with ovalbumin, no bronchoalveolar lavage inflammation was observed (data not shown). Time course of bronchoalveolar lavage inflammatory cell infiltration and interleukin-4 and interleukin-5 levels following ovalbumin challenge. Actively sensitised female and male mice were challenged with a nebulised solution of ovalbumin and sacrificed at different time points for bronchoalveolar lavage. Data are expressed as mean ± standard error of 6–8 mice per group. # indicates significance when comparing male and female mice at the same time point. At day 1 post-challenge, budesonide dose-dependently inhibited the ovalbumin-induced increase in neutrophil, eosinophil and lymphocyte numbers in the bronchoalveolar lavage. Though budesonide treatment had no significant effect on the macrophage numbers when compared with vehicle treated animals, when male and female were compared a significant decrease in macrophage numbers was observed in female mice treated with 3 mg/kg budesonide (Figure 2). Effect of budesonide treatment on bronchoalveolar lavage inflammatory cell infiltration and interleukin-5 and interleukin-4 levels at day 1 post challenge. Actively sensitised female and male mice were treated intranasally with vehicle (n = 10), 0.3 mg/kg (n = 10) or 3 mg/kg (n = 10) of budesonide and challenged with ovalbumin 1 hour later. Data are expressed as mean ± standard error. * and # indicate significance against the vehicle-treated group and when comparing male and female mice, respectively. A significant inhibition of all other inflammatory cell types infiltrating the airways was observed at a dose of 0.3 mg/kg budesonide in the female group whereas this dose had no significant effect in males. However, when comparing between genders, no significant differences were found. The same degree of inhibition for all the inflammatory cells was obtained at a dose of 3 mg/kg in both genders. 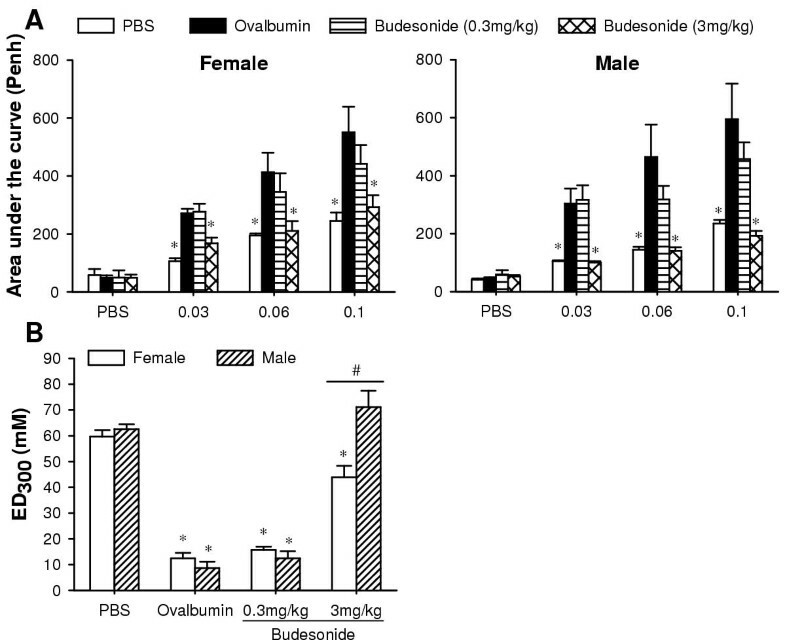 The ovalbumin-induced increase in interleukin-4 levels in the bronchoalveolar lavage was inhibited dose dependently by budesonide with similar efficacy in both female and male animals (Figure 2). The allergen-induced increase in interleukin-5 levels was also dose-dependently inhibited by budesonide. However, female mice were significantly less sensitive to the budesonide inhibition at a dose of 0.3 mg/kg (Figure 2). As observed one day after the challenge, on day 2 post challenge, a dose of 0.3 mg/kg budesonide significantly inhibited the neutrophil, eosinophil and lymphocyte numbers only in female mice. However, when comparing between genders, only the eosinophil numbers were significantly different. At a dose of 3 mg/kg budesonide inhibited the cellular inflammation with equal efficacy in both genders (Figure 3). Effect of budesonide treatment on bronchoalveolar lavage inflammatory cell infiltration at day 2 post challenge. Actively sensitised female and male mice were treated intranasally with vehicle (n = 8), 0.3 mg/kg (n = 8) or 3 mg/kg (n = 8) of budesonide and challenged with ovalbumin 1 hour later. Data are expressed as mean ± standard error. * and # indicate significance against the vehicle-treated group and when comparing male and female mice, respectively. 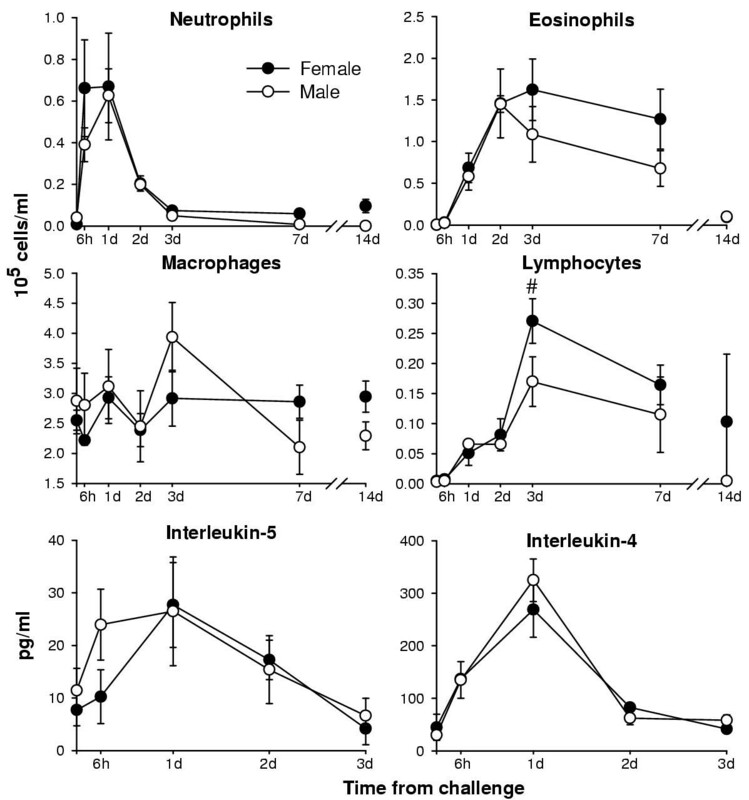 In order to assess the possible gender differences in systemic inflammation, female and male mice were sacrificed one day after the aerosol challenge and whole blood inflammatory cell counts and total serum immunoglobulin E levels determined. No gender differences were observed in any of the cell types counted (i.e. neutrophils, eosinophils, monocytes and lymphocytes). In contrast, when compared with male mice, a two-fold increase in the total serum immunoglobulin E was measured in female mice (Table 1). In sham sensitised animals (Alum only), the baseline levels of total serum immunoglobulin E were similar in female (1.8 ± 0.5 μg/ml) and male mice (1.4 ± 0.2 μg/ml). In both male and female mice, budesonide had no significant effect on the blood inflammatory cell numbers or total serum immunoglobulin E levels (data not shown). Data are expressed as mean ± standard error. Significance, indicated by * is against female mice. Twenty four hours after challenge with ovalbumin there was a significant increase in airway reactivity to aerosolised methacholine when compared with PBS-challenged animals. In both PBS- and ovalbumin-challenged animals, no significant gender differences in the baseline airway response or in the airway response following methacholine challenge was observed (Figure 4A). In both genders, the hyperreactivity to methacholine was unaffected by 0.3 mg/kg of budesonide. When given at a dose of 3 mg/kg, budesonide fully inhibited airway hyperreactivity in male mice with only partial reduction observed in female mice (Figure 4A). This gender difference was further exemplified by the concentration of methacholine that produced a three-fold increase above baseline (ED300) (Figure 4B). No increase in airway reactivity was observed in sham sensitised mice (Alum only) challenged with ovalbumin (data not shown). Measurement of airway hyperreactivity to aerosolised methacholine and effect of budesonide treatment. Actively sensitised female and male mice were treated intranasally with vehicle and challenged with PBS (n = 8) or ovalbumin (n = 10) one hour later. Different groups of animals were intranasally treated with 0.3 mg/kg (n = 10) or 3 mg/kg (n = 10) of budesonide and challenged with ovalbumin one hour after. Airway hyperreactivity to aerosolised methacholine was measured 24 hours after the challenge using whole body plesthysmography. ED300 values for methacholine (panel B) were calculated from the dose-response display in panel A by log-linear interpolation. Data are expressed as mean ± standard error. * and # indicate significance against the vehicle-treated group and when comparing male and female mice, respectively. Allergen-driven murine models of lung inflammation are widely used to study the mechanisms of human asthma [12, 13]. However, little consideration has been given to the potential effect of gender. In this study we demonstrate that, despite a two-fold increase in total serum immunoglobulin E present in female mice, following acute allergen challenge, actively sensitised BALB/c mice develop lung inflammation and hyperreactivity that is independent of gender. In addition, our results suggest that gender may slightly influence the potency of anti-inflammatory drugs such as budesonide. The aim of this study was to extend previously published work that suggested gender differences in the development of the allergic response induced by ovalbumin in BALB/c mice . In that study, using a similar model to the one described here, the authors showed that actively sensitised and challenged female mice had higher levels of serum immunoglobulin E and blood eosinophil numbers. In addition, in vitro restimulation of lung homogenates with ovalbumin induced an increased production of T-helper 2 cytokines in female versus male mice. However, airway inflammatory cell infiltrate and hyperreactivity, two main characteristics of human asthma, were not studied . 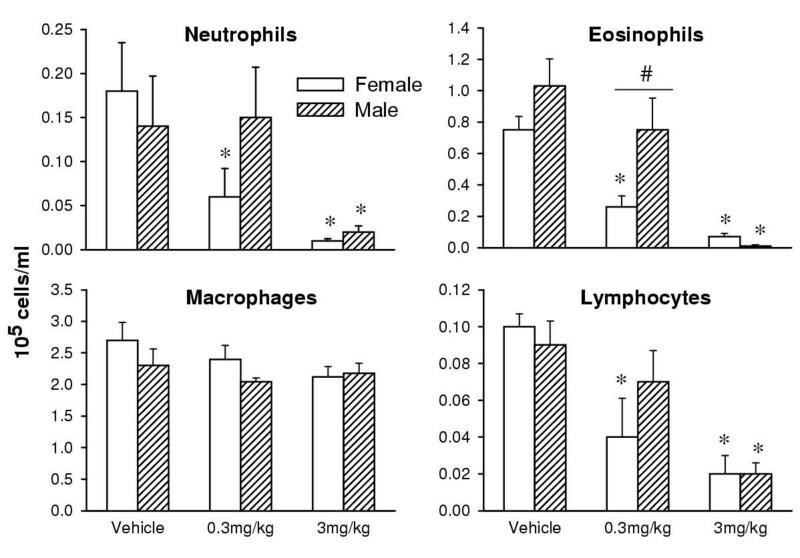 Here, we confirm the increased levels of total serum immunoglobulin E in female mice, and demonstrate a trend for increased eosinophil numbers in female mice, albeit not significant. However, in our study, gender did not affect T-helper 2 cytokine production which is in contradiction to previously published results. Reasons for this difference are unknown, although cytokine levels in response to in vivo allergen challenge were measured whereas Seymour and colleagues  studied cytokine production following in vitro restimulation. It is interesting to note that despite a two-fold increase in serum immunoglobulin E, female mice develop a similar degree of lung inflammation and hyperreactivity as male mice when challenged locally with the allergen. Immunoglobulin E plays a central role in allergic diseases such as asthma  and its role in the development of airway inflammation  and airway hyperreactivity  in murine models of allergic asthma has been confirmed. Therefore, one might expect increased airway inflammation in female versus male mice. However, the importance of immunoglobulin E in murine asthma models has been shown to be dependent on the method of allergen sensitisation . Immunoglobulin E seems to play a minor role in the development of airway inflammation and airway hyperreactivity in mice that have been systemically sensitised and challenged via the airways . Taken together, our data demonstrate that, apart form an increased level of serum immunoglobulin E in female mice, there is no gender dependency on airway inflammation and hyperreactivity following an acute allergen challenge in actively sensitised mice. The second aspect of this work was to test whether gender could influence the efficacy of anti-inflammatory agents such as budesonide, an inhaled glucocorticosteroid which is widely used as an anti-inflammatory agent for the treatment of asthma. We felt it important to study this aspect for two reasons. First, evidence suggests that gender could modulate glucocorticosteroid sensitivity [3, 11]. Second, murine models of asthma are often used as a primary model for evaluating the in vivo efficacy of potential anti-inflammatory drugs, like steroids, for the treatment of asthma [5, 19, 20]. However, researchers have used either male or female mice and to our knowledge no study has addressed the possible gender influence on steroid efficacy in these murine models. Our data suggests that gender could affect the potency of steroids when studying allergen-induced airway inflammation and hyperreactivity. When tested against airway hyperreactivity, budesonide treatment was not able to fully reverse this parameter in female mice, whereas a complete reversal was observed in males. Similarly, a significant inhibition of allergen-induced interleukin-5 production on day 1 and eosinophilia on day 2 was observed at a dose of 0.3 mg/kg of budesonide in females only. Moreover, when used at a dose of 3 mg/kg, a similar degree of inhibition was observed independent of gender. Taken together, our data suggests that although gender might affect the potency of anti-inflammatory drugs such as inhaled steroids, these differences remains subtle. In summary, we have shown that despite a two-fold increase in serum immunoglobulin E in females, actively sensitised BALB/c mice display a similar degree of airway inflammation and hyperreactivity induced by aerosol challenge in both genders. In contrast, gender may influence sensitivity to inhaled steroids such as budesonide. This suggests that while gender is not important when studying airway inflammation, it does influence the systemic response and may have a minor influence on the potency of test compounds such as steroids. Six week old female and male BALB/c mice were obtained from Charles River (Margate, UK). All animals were housed in plastic cages (6–10 animals per cage) in an air-conditioned room at 24°C with a 12 hours light-dark cycle. Food (RM1 rodent diet, Lillico, Surrey, UK) and tap water were available ad libitum. All animals were acclimatised for a period of at least 7 days upon arrival before any experimental work began. The studies conformed to the UK Animals (scientific procedures) Act 1986. Mice were immunized intraperitoneally with 10 μg of ovalbumin, (grade V, Sigma, Poole. UK) in 0.2 ml of Alum or with Alum alone (Serva, Heidelberg, Germany) on day 0 and day 14. On day 21, animals were exposed, for 20 minutes, to an aerosol of ovalbumin in phosphate-buffered saline (PBS, 50 mg/ml) or PBS alone. The experimental protocol and all the techniques mentioned thereafter have been previously described in details [9, 21]. Terminal anaesthesia was induced with pentobarbitone sodium (60 mg/kg, intraperitoneally). The trachea was cannulated and bronchoalveolar lavage was performed by injecting 4 times 0.3 ml of PBS into the lung via the trachea. Total cell counts were determined and cytospin preparation (Shandon Scientific Ltd, Cheshire, UK) were made. Cells were stained with Dif-Quik (Baxter Dade AG, Dudingen, Switzerland) and a differential count of 200 cells performed using standard morphological criteria. The remaining lavage fluids were centrifuged at 400 × g for 10 minutes, the supernatant was aliquoted and stored at -80°C for cytokine levels determination using commercially available kits (Endogen, Wolburn, MA, USA). One day after the aerosol challenge, mice were anesthetised and blood was taken from the aorta. Three hundred μl of blood was used for serum preparation and determination of total immunoglobulin E levels . From the remaining blood sample, total white blood cells numbers were determined, and peripheral blood smears prepared. Differential cell types were determined on blood smears, stained with Diff-Quick by randomly counting 300 leukocytes. Airway hyperreactivity was measured using barometric plesythmography and whole body plesythmography . One day following aerosol challenge, conscious mice were placed in the plesythmography chamber (Buxco Electronics, Sharon, CT, USA) and baseline respiratory parameters measured for 5 minutes. Animals were then sequentially exposed to aerosolised PBS and increasing doses of methacholine (0.03 to 0.3 M). Nebulisation was performed for 2 minutes and the airway response, Penh, was measured for the following 5 minutes and expressed as total area under the curve. For comparison between groups a sigmoidal curve was fitted to the dose-response data and used to calculate the concentration of methacholine that produced a three-fold increase above baseline Penh (ED300). Mice were treated via the intranasal route, under halothane/oxygen/nitrous oxide anaesthesia, one hour before the challenge with a suspension of 0.3 or 3 mg/kg of budesonide in PBS containing 2% dimethyl sulfoxide. Control mice received 50 μl of vehicle. Data are expressed as means ± standard error and statistical significance (P < 0.05) was determined using a Mann-Whitney test. R.C. and A.T. conceived the study, participated in its design and carried out all the experiments reported. Both authors read and approved the final manuscript.